Whenever online shopping is mentioned in China, the first website that occurs to a consumer must be Taobao.com (Taobao). Established in 2003 by Alibaba Group, Taobao grew rapidly in the newly emerged e-commerce industry in China. As a Consumer to Consumer (C2C) platform, Taobao asks basically for nothing from a merchant seeking to open a store on it. Thus, a large number of merchants registered with Taobao in a shockingly short time. This helped Taobao out produce eBay in only one year of operations and made it the leading website in China’s e-commerce market. At present, Taobao serves all kinds of products from clothes and bags to computers and cars; its consumers cover the majority of Chinese netizens. In 2008, Taobao launched its Taobao Mall Channel (Taobao Mall), which marks its marching into the Business to Consumer (B2C) market. There were mainly two reasons behind this move. One was that as the market developed, the shortcomings of Taobao began to present themselves. As a C2C platform, whoever possessed a computer with internet access was capable of opening a shop on Taobao, and making some money from the blooming industry. However, since the price of each item on Taobao can be clearly seen by consumers, the merchants have to resort to lower prices to attract market share. Eventually Taobao, the platform operator, found that it was stuck a situation where it could not profit the prosperous market it had helped create. In addition, the low cost for opening a new store and the never ceasing price wars have filled Taobao with all kinds of counterfeits. On Taobao one can not only buy LV bags for less than 100 yuan, Omega watches for a few hundred yuan and other luxury products at shockingly low prices, but also search for counterfeits of different levels. Take the most frequently infringed brands, Adidas and Jack Jones for example. The merchants are brazen enough to state clearly in the item’s description that it is “identical” or “similar” to the original. 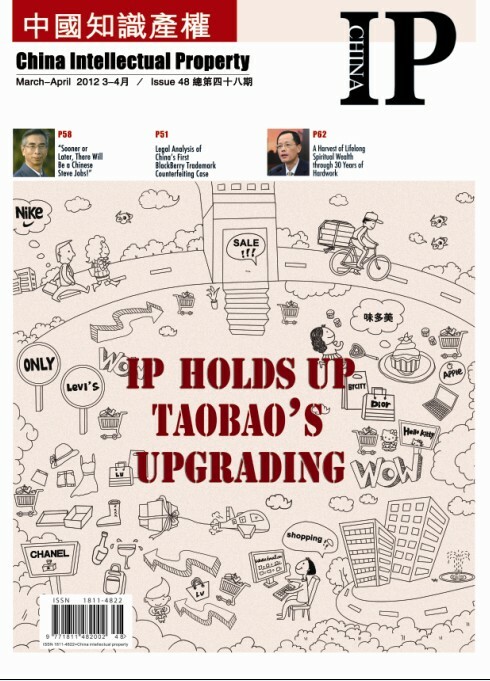 The ubiquitous IP infringement issues on Taobao began to hold back the development of the platform. Meanwhile, as the market matures, competition in China’s e-commerce is also becoming more and more intensified. Today, China’s online market is no longer dominated solely by Taobao. The whole e-commerce industry in China is undergoing a shift from emphasizing on item exchanges between individuals to targeting the new business mode where the manufacturers market their products directly to the consumers, i.e. from C2C to B2C. With this new model, Taobao’s rivals start to show up. As the currently leading B2C platform in China, 360buy.com (360buy) has started out financing, and the other B2C platforms are following its step. These platforms are striving to enlarge their market shares and have attracted many consumers by offering only genuine items. According to the insiders, China’s B2C business is still at an early stage. The common expectation is that within two to three years the e-commerce will develop rapidly and vigorously and the market will double. Maybe it was the bright future of the B2C market and the competitive threats that motivated Alibaba and Taobao to accelerate the development of Taobao Mall. As it is known, when the Taobao Mall Channel was launched, it depended mainly on the highly profitable large stores, brand owners’ and authorized stores which originally operated on Taobao. Afterwards it concentrated more on various brand owners and authorized stores, especially well-known brands such as Motorola, Nike and Adidas. Taobao Mall also put forward several special services including “Genuine Guarantee, ” and “Free Return and Refund Policy” within 7 days of receipt of shipment. These services changed the online shopping process on Taobao from “looking for genuine items among counterfeits” to “select the highly quality products from genuine items,” and as a result Taobao Mall attracted a large number of consumers. Distinguished from the other B2C platforms in China, Taobao and Taobao Mall enjoys an innate cooperative relationship. Taobao Mall shares its consumers with Taobao. Therefore when it was launched, Taobao Mall already had access to 98 million consumers, which formed an unrivaled advantage. Taobao also spared no effort in promoting the B2C platform. With the support of Taobao, Taobao Mall soon became a major service of Taobao, and brought Taobao more consumers and profit in return. On November 1st, 2010, Taobao launched its vertical marketing strategy and announced that Taobao Mall had formally began to use its own domain name tmall.com to differentiate its listings those of from its merchants, who are mainly brand owners or authorized distributors from Taobao’s C2C merchants. Taobao also promised that it would invest 30 million dollars in three months to promote the brand name Tmall. On June 16th, 2011, Taobao declared that it had been reorganized into three separate companies: Taobao Marketplace (C2C), Tmall (B2C) and eTao (a shopping search engine), which marked Tmall’s first step on its road to independent operation. However, separation is not the solution to Tmall’s old problems. Unlike 360buy, Vancl, Amazon and other traditional B2C platforms, currently Tmall is not capable of controlling the storage and delivery of goods. It must rely on individual merchants to take charge of that portion of the supply line to customers. As a result, it surely cannot match with the above-mentioned platforms in ensuring the qualities of the items, the delivery speed and detailed services. When Tmall was first established, it was included in Taobao’s system, so that many unlicensed small shop owners took the opportunity to register on Tmall and started their own businesses there, therefore making the B2C platform simply another place for the marketing of counterfeits and infringing products. Some insiders stated clearly that the “B” in Tmall’s “B2C” business mode actually meant “Tmall’s online stores” rather than Tmall itself. Under this business model, if Tmall ever wants to seek further development, the most critical problem confronting it should be how to solve the IP problems brought in by its unique operating mode, namely, developing a B2C business on a basically C2C platform. In the New Rules it is also emphasized that Tmall will introduce a new policy of “paying the liquidated damages” as a violation punishment measure. According to this policy, each time the merchant violates the rules of Tmall, his corresponding scores will increase, and if the score reaches a certain number, the merchant must pay the liquidated damages as required. The money will not be included in the profit of Tmall, but will be added into the security deposit and will be used to protect the interests of consumers. In addition, Tmall will increase the protection for consumers by giving them 5 times compensations if the products they bought are found to be counterfeits, unauthorized goods, parallel imports or made from counterfeiting material compositions. Meanwhile, Tmall will also provide a substantial increase in compensations for delays in delivery, descriptions that do not match the product, broken promises and other irregularities on the merchants’ side. Tmall also declared that any store found to be selling counterfeits, unauthorized goods and parallel imports would be shut down permanently and the technical support fee and security deposit will not be returned. After its release, the New Rules angered the small vendors with the significantly higher technical support fee and security deposit. Under the New Rules, in 2012, the annual technical support fee increased from 30,000 yuan to 60,000 yuan, depending on the size of the stores, and the security deposit would hike from 50,000 yuan, 100,000 yuan to 150,000 yuan. It is reported that the detailed rules on how much security deposit must be paid is determined as follows: (1) To brand owners: those provide only products under registered trademarks in their store pay 50,000 yuan while those who also provide products under trademarks pending to be registered pay 100,000 yuan; (2) To authorized stores: those provide only products under registered trademarks in their stores pay 100,000 yuan, while those who also provide products under trademarks pending to be registered pay 150,000 yuan; (3) Stores providing goods of different categories and/or under different trademarks must provide 150,000 yuan; (4) Stores providing goods whose trademarks have not been registered in the mainland should pay 150,000 yuan. It can be seen that Tmall’s intent of passing the trademark infringing risks onto the stores is very obvious. After the releasing of the New Rules, several large vendors on Tmall were attacked by about 4,000 well-organized attackers, most of which were smaller vendors on Tmall. They placed massive orders and then immediately returned the products demanding refunds, while giving the large vendors poor ratings at the same time. The Department of Electronic Commerce and Information of the Ministry of Commerce soon started to intervene. Jack Ma had to come up with 5 approaches and invested 1.5 billion yuan to settle the affair. However, although the price was high, Tmall continues to strive ahead on its B2C road. At this point it’s no longer a secret that Jack Ma is determined to keep Tmall far away from IP problems. In the press conference held by Alibaba on October 17th last year, Jack Ma made it clear that the starting point of the New Rules was that “Several governmental departments are taking joint actions to combat online infringements. China’s e-commerce keeps on growing as well. If we do not take any measures to quiet down counterfeits now, it will be hard for China’s e-commerce to achieve further development.” On October 20th, Jack Ma reiterated that Alibaba has never given in and will never give in on IP issues. On November 11th, 2011, the day Chinese young people addressed as a rare and remarkable “Singles’ Day” (six 1s in a row in “2011, 11, 11”), Tmall launched a special campaign of 50% off for all items. According to the statistics, on that day alone, the volume of trade on Tmall reached 3.36 billion yuan. At the beginning of the new year Tmall changed its Chinese name into “天猫” (Tmall’s Chinese pronunciation, meaning something like “a divine cat”), thus distinguishing itself further from the Taobao Marketplace. To date, Tmall has had over 400 million buyers, 50,000 shops and 70,000 brands. Many well-known brands, such as Kappa, Levi’s, Esprit, Jack Jones, Lock & Lock, Lenovo, HP and Disney, have opened their own official shops or authorized shops on Tmall, which received a warm welcome from the consumers. However, is Tmall as noble as it appears to be in IP related issues? Are there any hidden reasons behind the New Rules? What does Jack Ma really want to do, make more money, promote IP or just protect Tmall from IP problems? Only time will tell.